The Licancabur volcano (6,014 m) located at the boundary of Chile and Bolivia hosts a lake that is amongst the highest lakes on Earth. The lake environment combines low-oxygen, low atmospheric pressure, and high-UV radiation. Sediments are formed in volcanic material. It is ice-covered most of the year but the bottom water temperature remains above freezing. These conditions make Licancabur a unique analog (comparison) to ancient Martian lakes. The summit lake is about the size of a football field at 90m x 70m x 4.5m. Poquentica stands 5,850 m high in the central Bolivian Andes. Its summit lake is ~200 m long. It is closer to the equator than Licancabur (6,014 m) and should experience higher UV radiation (216% that of sea level at Licancabur). Aguas Calientes is a symmetrical cone with a summit elevation of 5,924 m. It is part of the east-west Lascar volcanic chain. 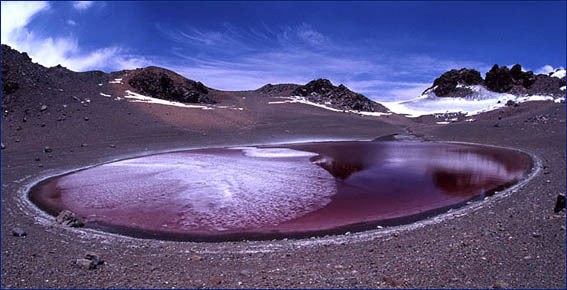 Aguas Calientes volcano has a circular basal plan ~7km in diameter and has a shallow summit lake with red water indicating a dense population of microorganisms.